Potential changes to a road in Welshpool town centre are being put to the public. The Welsh Government launched a consultation on Monday on proposals for the A458 one-way gyratory system. It follows a review in 2017 based on concerns raised by traders and residents. 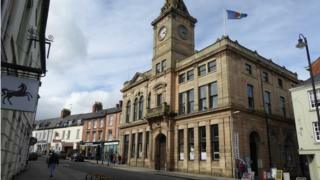 Several changes are being considered including a possible zebra crossing on Broad Street near the town hall. Another is the possibility of reducing Broad Street to a single lane from The Cross to the High Street outside the town hall. The final proposal is to make Brook Street traffic two-way between Church Street and Jehu Road. The consultation began on Monday and lasts until 3 December. Transport Secretary Ken Skates said: "Businesses and residents have previously expressed their concerns over pedestrian safety, driver behaviour and parking issues in Welshpool town centre. "This consultation provides an excellent opportunity for people to share their opinion on the proposed options aimed at improving traffic flow and safety." Drop-in sessions will be held on 14 September and 30 October at Welshpool Town Hall between 10:00 and 19:00. The consultation documents and plans will also be available for viewing during opening hours at Welshpool Town Council offices and the Tourist Information Centre for the full 12 weeks.